Maximum Altitude : : 6654m. If you have previous high altitude trekking experiences, Mera peak is a perfect adventure awaiting for you. 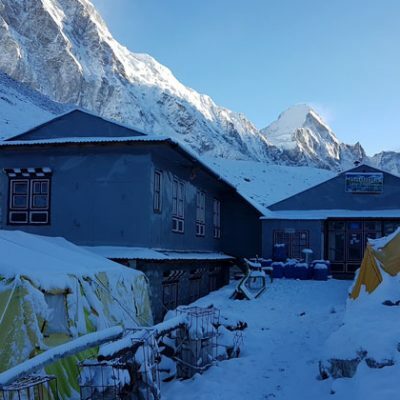 If you plan on climbing the Mera Peak, you will be rewarded with the panoramic view of the mountain ranges such as Mount Everest, Mount Lhotse, Mount Cho Oyu, Mount Kanchanjungha and Mount Makalu. 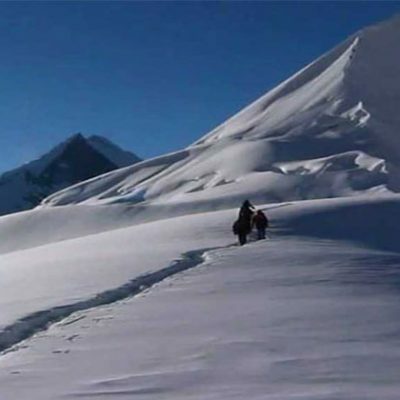 Mera Peak Climbing offers an incredible trekking experience into the gorgeous Mera peak. 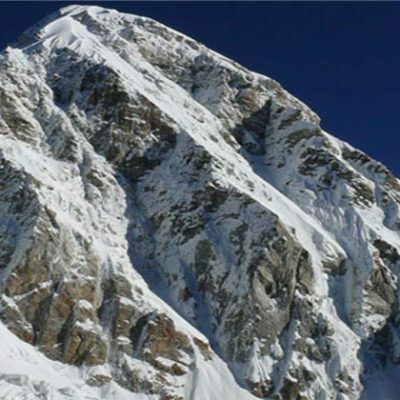 The extreme altitude during Mera peak climbing is a tough challenge. Even if you’re fit, this challenging trek demands lots of stamina, endurance, and few technical skills. Mera Peak climbing begins with a flight from Kathmandu to Lukla. From Lukla, you will trek to Chutang, Chetra la pass 4600m, Thulikharaka, Kothey, Tangnag, Khare and to Mera High camp. You’ll be camping at the Mera high camp for a night. From high camp, you will summit the Mera 6476 meters peak to catch a mesmerizing sunrise view. During Mera Peak Climbing, trekkers can experience trekking and climbing, both at the same time. You must use various climbing equipment for Mera peak climbing. If you’re a beginner, climbing the Mera peak can be difficult. We advise you to get some training on using the climbing equipment’s. Also, you should do some training to build up a strong physique. You will be able to witness various waterfalls, lakes, and passes along the way to the Mera Peak. The lush jungles filled with varieties of wild flora and fauna will allure you. The journey to Mera peak is beautiful. Mera Peak Climbing with Adventure Great Himalayas will be more interesting and fun. We have well-experienced representatives to help you throughout your journey. You will have proper food and accommodation facilities as well. 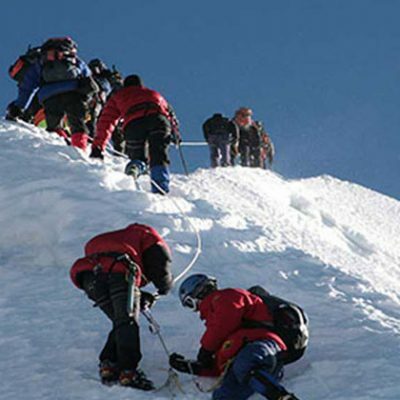 You’ll have one of the best climbing expeditions if you plan Mera Peak Climbing with us. Climbing the Mera Peak, the highest trekking peak in Nepal. Exploring the beautiful view of the mountains such as Mount Everest, Makalu, Kanchanjungha, Amadablam, Thamserku, and many others. Exploring the Sherpa Villages, the people and their lifestyle. An opportunity to explore the beautiful Everest region. Autumn and Spring are one of the best seasons for trekking and climbing the Mera Peak. The autumn season lasts in the month of September, October, and November. 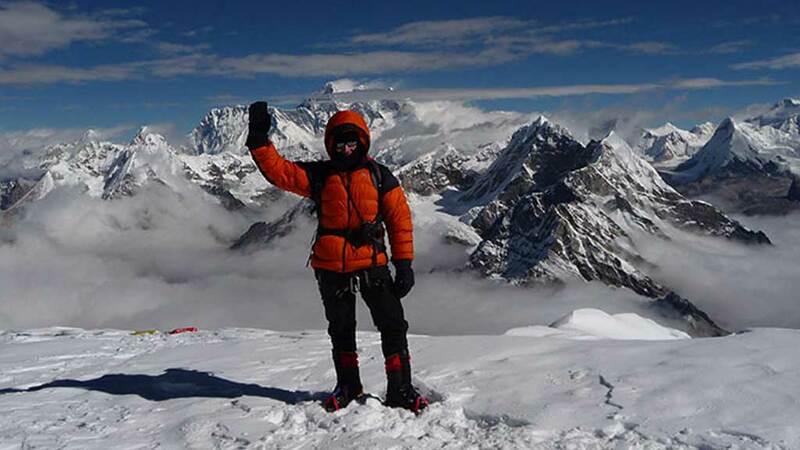 During autumn the weather and temperature of the Everest region are around 12 degrees during the day time. The temperature at the peak may fall to minus. Although the weather may be cold at the peak, it is bearable. You can also have amazing visibility of the mountains and landscapes during the autumn season. Similarly, Spring falls in the month of March, April, and May which is favorable for Mera Peak climbing. The average temperature of the Everest region is around 10 degrees during the day time. The temperature may fall to minus during the night time. You will be able to witness the scenery of the mountains and landscapes even more vividly during the spring season. The temperature of the Mera is cold in every season but, the temperature reaches its minimum during the winter season. If you wish to climb the peak during winter, make sure you carry proper trekking and climbing equipment. Mera Peak stands at an altitude of 6476 meters making it the highest trekking peak in Nepal. The difficulty level depends upon various factors such as the time of the year you will be trekking. It also depends on your strength. 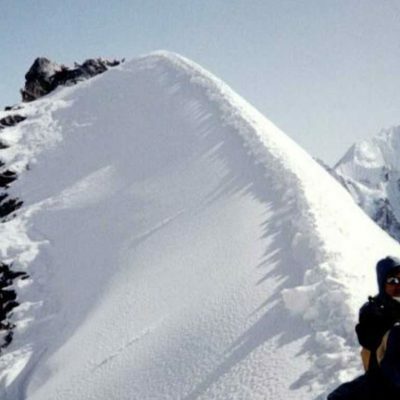 If you are someone who is used to trekking and mountain climbing above 4000 meters to 5000 meters, Mera Peak Climbing might be a next to perfect adventure for you. But if not, it may be quite challenging as it requires a lot of stamina and endurance. Trekking to the Mera Peak means you may have to walk for 4 days above the altitude of 5000 meters. So, there is a high chance of altitude sickness. You may be in short of breath as you trek to the Mera peak as at this altitude, the content of oxygen in the air is half of what it is at the sea level. If you find susceptible to altitude sickness with symptoms such as headache, nausea, and vomiting, immediately descend to a lower altitude. For climbing Mera Peak, you should be able to walk for about 6-7 hours. Fly to Lukla 2800m. Rest and free day. Trek from Kothey to Tangnag ( 4350m, 4 hour). Airport / Hotel Airport Transfer car/van/Bus. All Lunch/Dinner in Kathmandu. also in the case of early return from mountain ( due to any reason) Than the scheduled Itinerary.